Oh man, this is a big week. Daredevil #605 and Darth Vader #18, both issues I’m very proud of, for different reasons. Let’s start with Daredevil. This is part 5 of the “Mayor Murdock” story, which concludes that arc, also concluding the second half of the “Mayor” duology which began with “Mayor Fisk” in Daredevil #595, which itself worked as the wrap-up to the story I’d been planning since my first issue on the title way back when. As you’ll see, it puts a bow on Blindspot’s story, sends Father Jordan off into the sunset, tags up on the Elektra stuff and does a million other things. It’s never easy to plan issues like this - they have to serve a billion story masters. It all started with what I consider my real theme statement for Daredevil: “I can’t see the light, so I must be the light.” I don’t want to spoil how it works in the issue if you haven’t read it yet, but watch for it. Daredevil gets down. It’s a major part of his character. He blames himself for what he sees as significant failings, internal and external, and uses his dual careers as vigilante and attorney to address things, to make things right. But what he doesn’t realize - and many depressed people don’t realize - is that the rest of the world doesn’t see him that way. To everyone but himself, he’s a hero, constantly and selflessly. 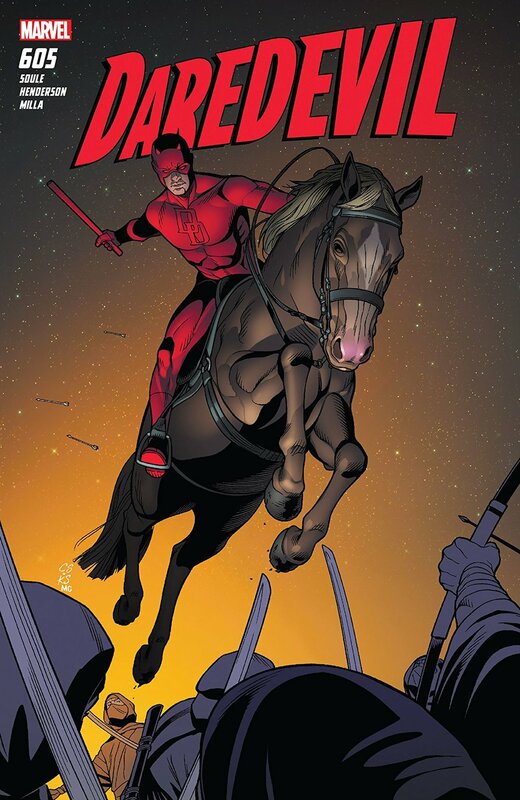 It’s Daredevil’s biggest blindness - he can’t see the light he brings to the world. That’s what this story has been about, and my run has been about. On to Vader #18 after the cover art below! Art by Mike Henderson, colors from Matt Milla, and letters by Clayton Cowles. The cover is by Chris Sprouse, inked by Karl Story, and colored by Marte Gracia. I really didn’t know what I was going to do, though. When I wrote it, I was traveling in India, and had just visited a sort of game reserve in the southern part of the country. It was gorgeous, and I saw lots of fascinating fauna (huge elephants, boar, antelopes, peacocks and peahens, buffalo and bears and tons more.) It was amazing, and it put me in mind of a hunt. Now, this place wasn’t a hunting reserve or something like that - it was a place to appreciate nature - but Vader’s fiction, so I can adjust reality as I choose. I also knew that Tarkin’s official backstory (primarily set out in the awesome TARKIN novel by James Luceno) has him growing up on a planet called Eriadu which is famous for its hunting culture. Tarkin is an expert big game hunter. What better game than Darth Vader himself? I wrote it very quickly, in one sitting, which is always a good sign. Sometimes, issues just work, from the start, and writing them is more like channeling than anything else. This was like that (and it almost never is.) I felt great about it when I turned it in, and it remains the one issue for which I got no notes from either Marvel or Story Group. Good stuff. Cammo, Daniele, David and the rest of the team turned in A+++ work on the art, bringing a tricky script to life wonderfully well. I was really hoping this one would land as well as I thought it might, and from the early reactions I’ve been hearing, it did. This is another story like DD #605, where a character’s inner life is in drastic opposition to how they’re seen externally. Vader is always burning, but no one can feel it but him. Cover below, and come back next week, when we’ll have a ton of stuff - Curse Words Vol. 3, the first Letter 44 HC, and much more (not to mention San Diego Comicon)! If you haven’t checked out the store yet, and you might be interested in signed items from me or other cool stuff, head on over. The Appearances page has my upcoming travel schedule, too. See you soon! Art by Giuseppe Camuncoli, inked by Daniele Orlandini, colors from David Curiel, and letters by Joe Caramagna. The cover is by Giuseppe Camuncoli and painted by Elia Bonetti.